Have you been increasingly struggling to read menus or the newspaper because you can’t make out the font? Or maybe you have to fumble for your eyeglasses before checking your iPhone because the screen always looks blurry? If so, a tiny, implantable lens may be able to help. In May, Dr. Steven Stetson, the medical director of the Diamond Vision clinics, and his team began offering the KAMRA inlay procedure, which improves near vision. “We’re excited about the results,” Dr. Stetson said. Dr. Stetson’s patients who have undergone the KAMRA inlay procedure are seeing significant improvement in their near vision, he said. The KAMRA inlay is a small, thin lens that is implanted in the cornea via laser surgery. It measures 3.8 millimeters in diameter, with a hole or aperture in the center that’s 1.6 millimeters. “[It’s] about a third of the size of a standard contact lens, and it weighs less than a grain of sand,” Dr. Stetson said. A member of Dr. Stetson’s office staff, Sofia Hernandez, 45, underwent the procedure two months ago. She had been wearing reading glasses for the past five years. Hernandez said she noticed an improvement in her near vision right away. Dr. Stetson and Diamond Vision were specifically selected last year to perform the procedure by AcuFocus, the medical device company that developed the technology. AcuFocus only selects the skilled surgeons and facilities that it knows and trusts, Dr. Stetson said. The inlay has been on the international market since 2002 but was only approved by the FDA in April 2015. The inlay works like a small camera aperture or the pinhole test your eye doctor does. It improves vision by focusing light coming into the eye. The focused light is what allows your eye to form pictures in the retina. “If you go to your eye doctor and they flip down that little pinhole and you look through it, then all of a sudden your vision gets better,” Dr. Stetson explained. The inlay is made from a high density, strong, but very light plastic called polyvinylidene fluoride, a biocompatible material commonly used for eye implants. Surrounding the central opening are 8,400 microscopic holes that allow oxygen and nutrients to flow naturally through the cornea—something the cornea needs in order to refract light properly. The inlay is put only in the non-dominant eye, which then regains near vision. Near vision in just one eye is enough for you to see close up. Both eyes preserve their distance vision. 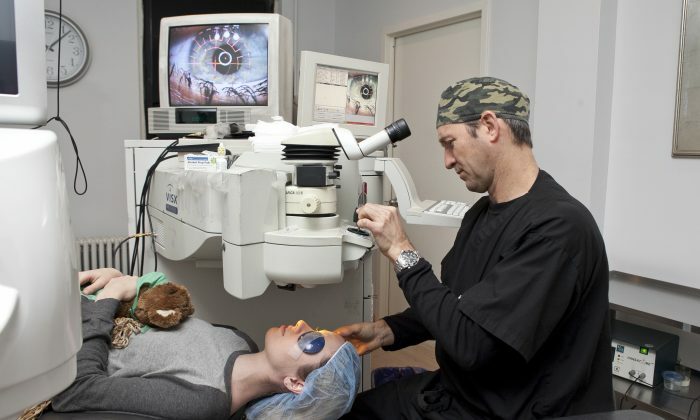 During the procedure, the surgeon makes a pocket in the deeper layers of the cornea using a femtosecond laser, which is the same laser technology used to make flaps in LASIK procedures. “We would put the inlay into that channel that we’ve created and it just stays right there,” Dr. Stetson said. The inlay parallels the curvature of your cornea, allowing it to sit securely in place, and it doesn’t change anything structurally, Dr. Stetson said. He said implanting the inlay is a snap. “I’ve done a lot more tricky procedures than this,” he said. And your near vision will stay clear for as long as the inlay stays in the pocket. “This is a visual solution for their lifetime,” Dr. Stetson said. Unlike LASIK surgery where patients see significant improvement overnight, most patients who get the KAMRA inlay see improvement after about two to three weeks. “This inlay is occupying space and there’s some fluid around the inlay that has to come to rest,” Dr. Stetson explained. The KAMRA inlay can be removed if need be, but this is rare. In the United States, only 1.6 percent of patients have theirs removed, so even though there can be some side effects, the majority of patients choose to stay the course. The basic side effects, such as dryness and seeing some ghosting on images or a glare effect, are similar to what people experience after LASIK surgery. In rare cases, there could be some scarring, but Dr. Stetson said that happens less than 1 percent of the time. People who have a cataract or already struggle with dry eye should get treatment for those conditions before getting an inlay, he said. Diamond Vision is currently the only center in Manhattan where KAMRA inlays procedures are performed.